PATNA: A man in Bihar has filed a treason case against All India Majlis-e-Ittehadul Muslimeen (AIMIM) leader Asaduddin Owaisi after his 100-year-old mother Rasidan Khatoon suffered serious shocks on hearing his “anti-national” statement in a local TV channel and had to be admitted to hospital for treatment. The case has been filed on the instruction of his mother. The case was filed in the Gopalganj district court on Thursday by Mohammad Kurban Ansari on the formal instruction of his ailing mother. The court has admitted the case for hearing. Ansari is a resident of Ekderawa village under Town police station in Gopalganj district. “My mother was listening news on a TV channel when she suddenly suffered shocks and had to be admitted to a local hospital. On gaining consciousness, she said she suffered shocks after hearing Owaisi saying that he will not ‘say Bharat Mata Ki Jai’ even if knives are placed at his throat”, Ansari mentioned in his complaint petition filed in the court of the Chief Judicial Magistrate. “Angry mother ordered me to file a case against that man saying she can’t tolerate such statements coming from him,” the complainant added. Owaisi created storms when he reportedly said he won’t utter “Bharat Mata ki Jai’ slogan even if you put a knife to my throat”, and then added, “Nowhere in the Constitution it says that one should say Bharat Mata ki Jai”. 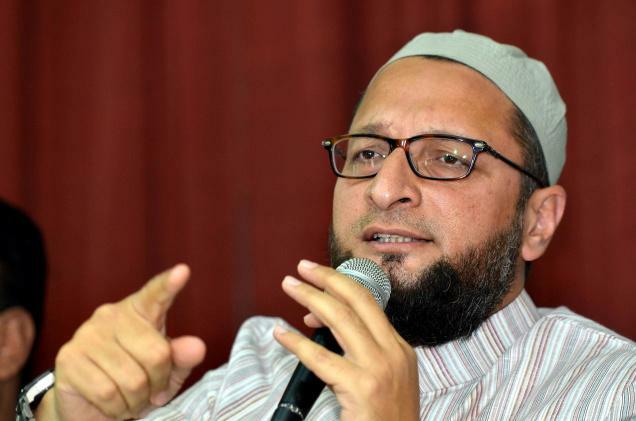 Owaisi who is infamous for making controversial remarks was apparently reacting to RSS chief Mohan Bhagwat’s suggestions that the new generation needed to be taught the slogans hailing ‘Mother India’. Only yesterday, another AIMIM leader and lawmaker Waris Pathan was suspended from the Maharashtra assembly for making “derogatory remarks” about India and refusing to say “Bharat Mata Ki Jai”. Two BJP parliamentarians from Bihar have reacted bitterly to such statements from Owasi and suggested him to leave India. “Owaisi should leave the country if he doesn’t love India,” said Union Minister of State for Micro, Small and Medium Enterprises Giriraj Singh. A firebrand BJP leader, Singh represents Nawada in the Lok Sabha. Another BJP parliamentarian RK Singh too asked AIMIM leader to leave the country. “Why is he living here if he does not love his home country?” asked Singh, former home secretary who represents Ara in the Lok Sabha.